Oil-Electric: A New Era Begins! November 1, 2007. The Prince George Citizen reports: “The first CN Rail train carrying cargo from the Prince Rupert container terminal is scheduled to pass through Prince George Friday morning, but you will have to be an early riser to catch it. Company spokeswoman said Thursday the train will stop in CN's south yard at 5:30 a.m. for a shift change and be gone in an hour. The 9,000-foot-long train is carrying 360 containers to Chicago after they were loaded off the Antwerp, a container vessel owned by the China Ocean Shipping Company (COSCO). The route is part of the CKYH Alliance’s Pacific Northwest Butterfly South Loop service, of which COSCO is one of four participating shipping lines. In all a string of nine vessels, each with a capacity of 2,700 containers will combine to provide weekly service to Prince Rupert." 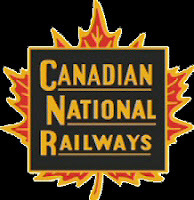 This new era means a lot to me, because as a mere youg lad of 14, back in 1957, I had my first encounter with the "oil-electrics" of the wild western reaches of the Canadian National Railways in Northern British Columbia. I would love to have been there today to see the double stack movement through Prince George, some 500 miles east of Prince Rupert. The beginning of a New Era!